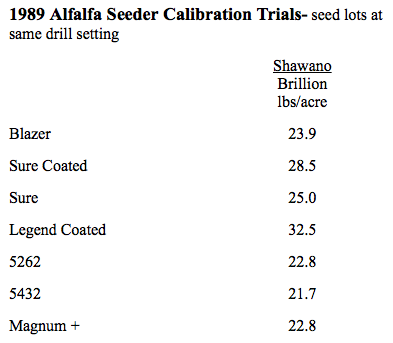 Many farmers neglect to calibrate their alfalfa seeder as they begin seeding in the spring. In doing so they are failing to take into account differences in seed size and may be seeding at higher rates than necessary. With good alfalfa seed costing $7 to $12 per pound this can be a costly mistake. Over several years Gary Vondracheck collected information on seeding rate of different varieties through farmers’ seeders left at the same setting. The results are shown in the following tables in which each column heading indicates the location of the farm and type of seeder used. The results show that large differences in seeding rate can occur when a seeder is not calibrated with each new lot of seed. In addition to seeding rate differences, seed lots also vary in seed size from 190,000 to 230,000 seeds per pound. The seed size alone can account for a difference of 4 to 6 seeds per square foot, even if the same number of pounds are seeded per acre. Though we list the varieties tested, we do not believe that seeding rate differences were necessarily due to the variety. As with grain production on farms in the Midwest, alfalfa seed size and test weight varies from one production site to another and year to year due to weather conditions occurring during the growing season. This means that the same variety of alfalfa may have different seed size and test weight depending on where and when it was grown. Seed size and test weight are the factors likely affecting the variation in seeding rate. 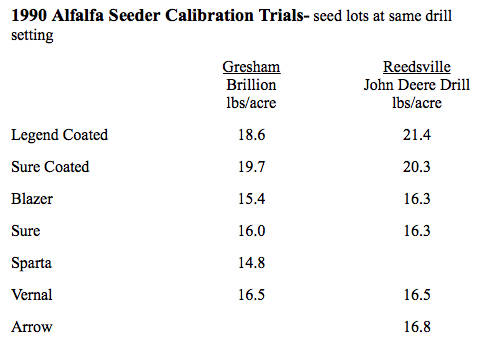 Thus, a farmer should calibrate with each different lot of seed and each year even if the same variety of alfalfa is being planted. The tables also indicate that coated seed seeded at a higher rate than uncoated seed. If using coated seed, the seeding rate must be adjusted down to get the same seeding rate (pounds per acre) as when using uncoated seed. 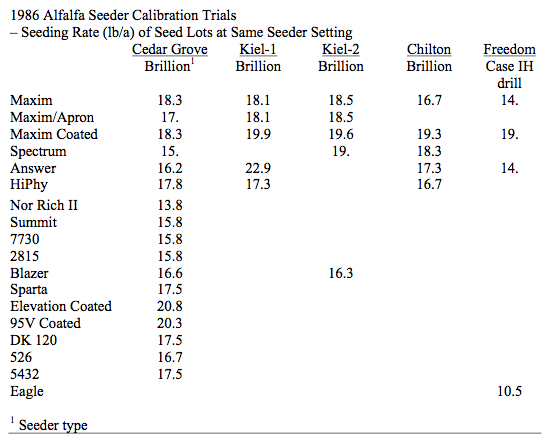 Differences shown in the table suggest that seeding rate can easily vary by 5 to 6 lbs per acre with the same seeder setting, regardless of seeder type. With good alfalfa varieties selling at $7.00 per lb., this can mean of difference in seeding cost of $35.00 to $36.00 per acre. It is worthwhile to calibrate a seeder. 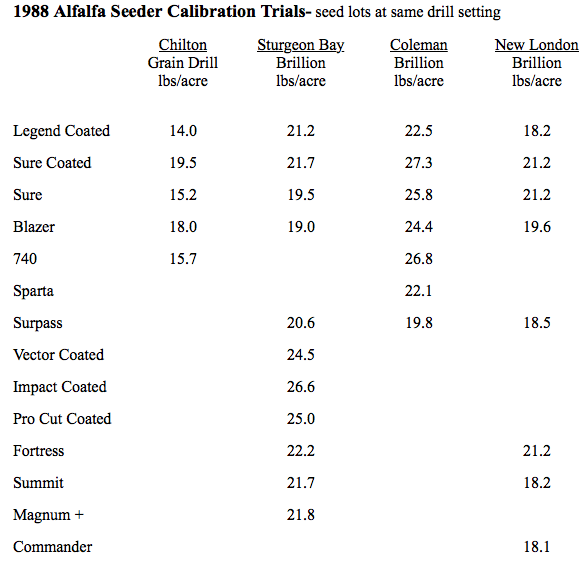 If one does not want to take the time and effort to follow the recommended calibration procedure for the drill, one should at least determine the acreage seeded with the first bag and, if different than 4 acres, adjust the seeding rate accordingly.